FORE-EDGE PAINTING. YOUNG, Edward. Night Thoughts, And a Paraphrase on part of The Book of Job. By Edward Young, D. D.. With the Life of the Author. London: Printed at Chiswick Press by C. Whittingham , 1812. 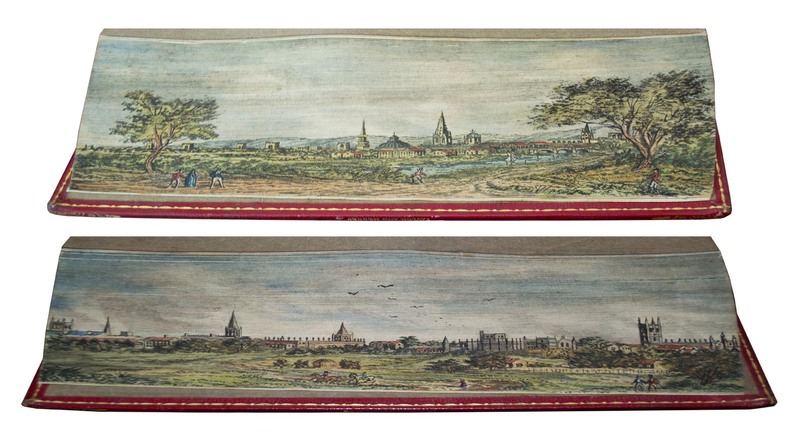 A rare double Fore-Edge painting by the artist of Taylor and Hessey depicting scenes from Oxford. Octavo (8 15/16 x 5 3/8 inches; 227 x137 mm). With frontispiece portrait. Bound by Taylor and Hessey in contemporary straight-grain red morocco. Boards richly stamped in gilt and tooled in blind. Spine stamped and lettered in gilt. Gilt dentelles. 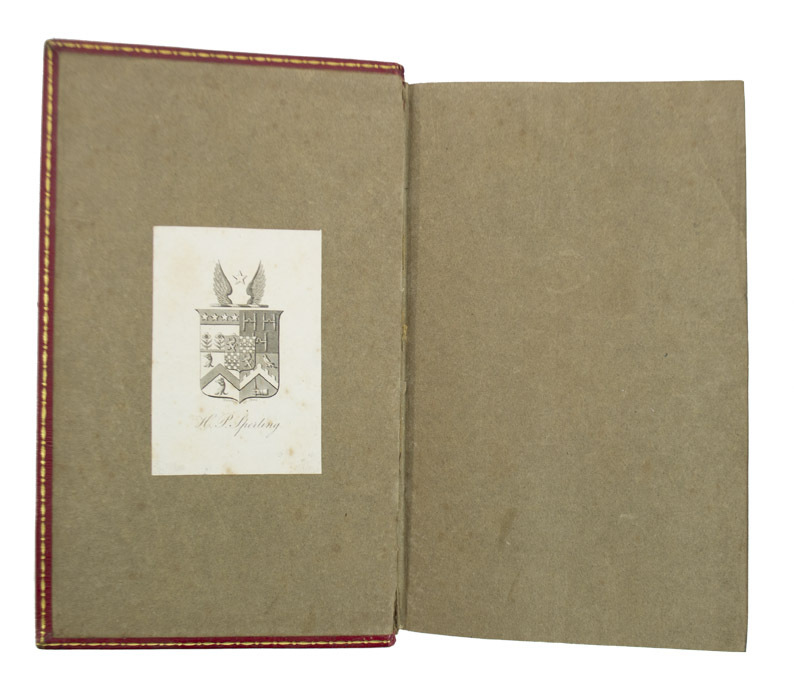 Stamp-signed in gilt on fore-edges of boards with "Taylor and Hessey Booksellers London." All edges gilt. Drab endpapers. Bookplate of previous owner H. P. Sperling on front pastedown. Some foxing to frontispiece and title-page but text is clean. Inner hinges just starting. Some minor rubbing to outer hinges. Overall a very nice copy with two beautiful fore-edge paintings. 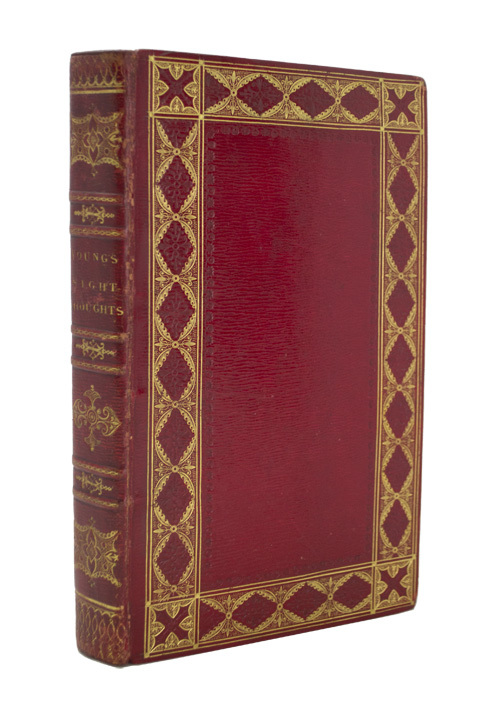 “Taylor & Hessey were busy throughout these fifteen years [1808-1823], not only in publishing and in binding, but also in re-binding books published by others...Taylor & Hessey usually bound their fine books in morocco—red, blue, brown, crimson, green—and ‘signed’ their bindings by stamping their name in gilt in the fore-edge of the binding (not the leaves, note), whenever the boards inside the leather were thick enough to carry the name of the firm...But their water-color artist who worked on the fore-edge of the leaves did not follow the same practice, and we are therefore unable to name that artist. This is regrettable, for he was an extremely able fore-edge decorator. At least twenty-four of his creations have reached American libraries and have been examined by the present writer...These paintings are enough to tell us something about the tastes and abilities of the Taylor & Hessey decorator. Except for a copy of Mrs. Tighe’s Psyche (London, 1811), on the fore-edge of which ‘the Marlborough Gem’ is painted, all the Taylor & Hessey edges are decorated with pictures of buildings or landscapes. The former predominate: Lambeth Palace, Roslin Castle, Haddon Hall, Westminster Abbey, Combe Lodge, St. Paul’s Cathedral, Buckingham Palace, etc.—these all follow the Edwards example. The painting of ’Buckingham Palace’ on the fore-edge of Thomson’s Seasons (London, 1809) is a fine piece of workmanship...and is distinguishable from the best work of the Edwards artist or artists chiefly by a less skillful execution of the reflections on the surface of the water. The Taylor & Hessey landscapes are equally splendid. A two-volume Cowper (London, J. Johnson, 1812)...has two delightfully executed fore-edge paintings: one a harvesting scene, with hills in the distance beyond rolling farmland country; the other, a woodland landscape, with a distant village seen through an opening in the foliage...there is a copy (once in the library of Prinz von Preussen at Dessau) of the anonymous English Minstrelsy of Fugitive Poetry (Edinburgh, John Ballantyne, 1810), with a beautiful painting, nicely preserved, of a white-towered castle on a river-bank...One of the very best of the Taylor & Hessey edges is a picture of Westminster Abbey from the river Thames, painted on an 1811 Bible” (C.J. Weber, Fore-Edge Painting, pp. 106-111). Young's greatest and most well-known work. "Although Night Thoughts is long and disconnected, it abounds in brilliant isolated passages. Its success was enormous. It was translated into French, German, Italian, Spanish, Portuguese, Swedish and Magyar. ... If Young did not invent 'melancholy and moonlight' in literature, he did much to spread the fashionable taste for them. Madame Klopstock thought the king ought to make him Archbishop of Canterbury, and some German critics preferred him to John Milton. 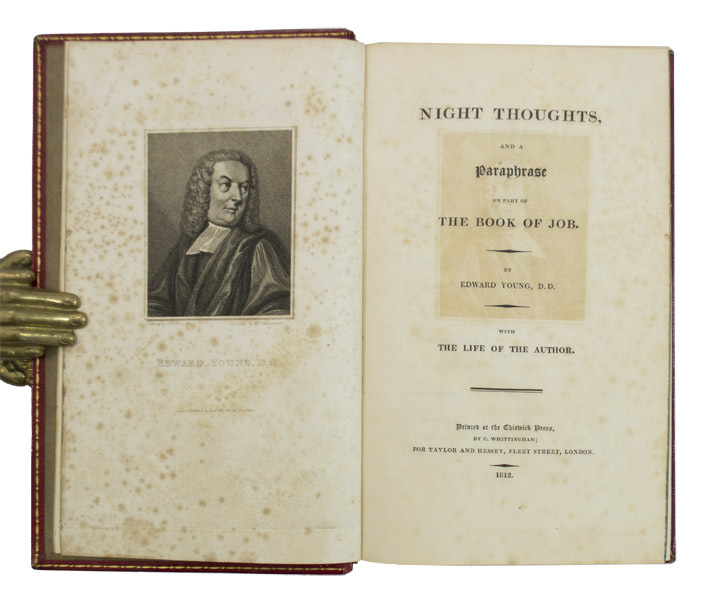 Young wrote good blank verse, and Samuel Johnson pronounced Night Thoughts to be one of 'the few poems' in which blank verse could not be changed for rhyme but with disadvantage. The poem was a poetic treatment of sublimity and had a profound influence on the young Edmund Burke, who's philosophic investigations and writings on the Sublime and the Beautiful were a pivotal turn in Eighteenth-Century aesthetic theory" (1911 Encyclopedia Britannica).